Dr Ella Iskrenko-Poulton and Professor Terry Poulton visited ZSMU for a two-days training (May 16-17) in the frames of the TAME project. 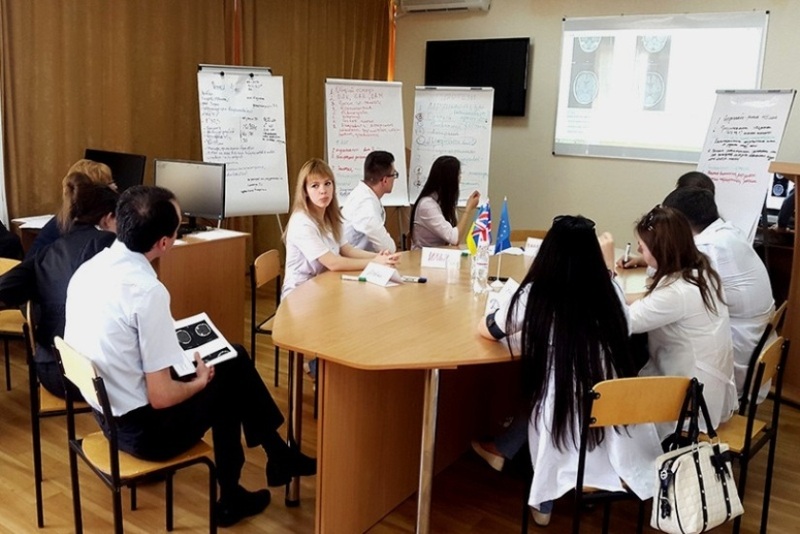 The training took place at ZSMU Medical Education Center with the participation of tutors from Zaporizhzhia State Medical University (6 tutors) and Bukovinian State Medical University (4 tutors). The tutors had an opportunity to practice their D-PBL skills on 3rd-year and 4th-year students. Each participant performed the role of a tutor under Ella’s supervision and gained deep knowledge and skills needed for further realization of the TAME project. Ella also made a presentation about D-PBL, its principles, special features and peculiarities. During the training each tutor and student gave their feedback and course evaluation, discussed specifics and difficulties in working with D-PBL cases. Professor Terry Poulton also presented his vision of future development of partner universities network, capacity building and integration plans. By the end of the training each participant received a certificate of Participation/Attendance.